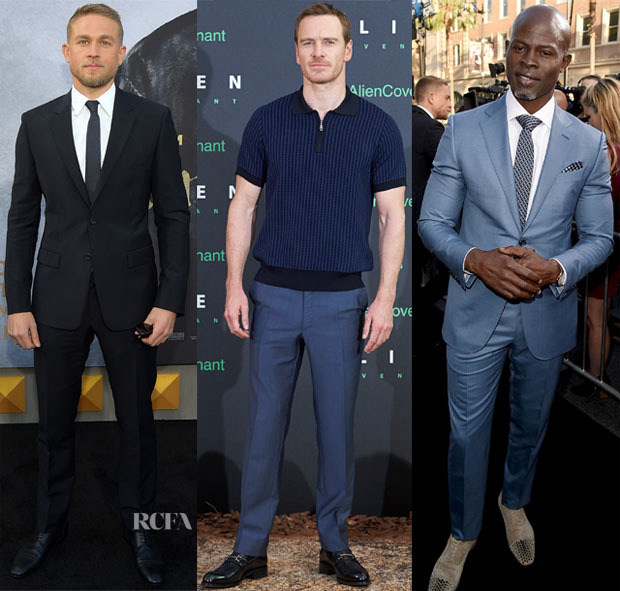 A few men have been making the rounds to support their respective films. Here’s a look at what they wore. Charlie Hunnam: Charlie joined the ladies at the LA premiere of ‘King Arthur: Legend Of The Sword’ was held on Monday (May 8). Looking sharp as usual, he kept it simple and straightforward in a traditional Prada suit with Christian Louboutin ‘So Charles’ brogues. Michael Fassbender: At the ‘Alien Covenant’ movie presentation in Madrid on Monday (May 8), Michael went low-key handsome in a top-to-toe Brioni ensemble that subbed in a short-sleeve sweater for a dress shirt and sport coat. It was a nice change of pace. Djimon Hounsou: Also at the LA premiere of ‘King Arthur: Legend Of The Sword’ Djimon impressed in his Ermenegildo Zegna blue-gray suit that he uniquely personalized with a patterned tie and pocket square as well as spike-embellished suede shoes.